Evidence ofa key mineral on Mars has been found at several locations on the planet's surface,suggesting that any microbial life that might have been there back when theplanet was wetter could have lived comfortably. The findingsoffer up intriguing new sites for future missions to probe, researchers said. Observationsmade by NASA's Mars Reconnaissance Orbiter (MRO), which just completedits primary mission and started a second two-year shift, found evidence ofcarbonates, which don't survive in conditions hostile to life, indicating thatnot all of the planet's ancient watery environments were as harsh as previouslythought. Thefindings are detailed in a study in the Dec. 19 issue of the journal Scienceand will be presented today at the annual meeting of the American GeophysicalUnion in San Francisco. Over the pastseveral years, evidence for water on Mars has been stacking up: Scientists havefoundgullies formed by running water, possible ancientlakes, and minerals formed by interaction with water. But justhow much water there was and how suitable it was for Martian microbes or otherprimitive life forms have been harder puzzles to solve. Mostevidence has pointed to a period when water on the planet's surface formedclay-rich minerals, followed by a time of drier conditions, when salt-rich,acidic water affected much of the planet. These later conditions would have provendifficult for any Martian life ? if it ever existed ? to endure or to leave anytraces for scientists to find. Becausecarbonates dissolve quickly in acid, finding them shows that at least some areasof the planet escaped the acid bath and were less hostile to life. Ifprimitive life sprang up in these pockets, it could have persisted and leftclues of its existence. "Primitivelife would have liked it," said study author Bethany Ehlmann, a graduatestudent at Brown University in Providence, R.I. "It's not too hot or toocold. It's not too acidic. It's a 'just right' place." The sitesare dry now, however, so researchers are not expecting to find biology on thesurface in those locations. NASA'snow-defunct PhoenixMars Lander also found carbonate signatures in surface samples it analyzedearlier this year. Researchers have also found carbonates in Martian meteoritesthat fell to Earth, as well as in windblown Mars dust observed from orbit. Butthis dirt and dust could have been mixtures from many areas, so the origins ofcarbonates have been unclear. Scientistshad expected to find "extensive layers of carbonate" because theywould be a natural consequence of the chemistry between Mars' carbondioxide-rich atmosphere and the weathering products formed by water acting onvolcanic rocks, said MRO project scientist Richard Zurek of NASA's JetPropulsion Laboratory in Pasadena, Calif. But no carbonate deposits could everbe found. But now, MRO'sfiner resolution has allowed scientists to finally locate carbonate. ? "Thesecarbonate exposures are small, which I think explains why we haven't seen themon the surface before," Ehlmann said during the AGU press conference. 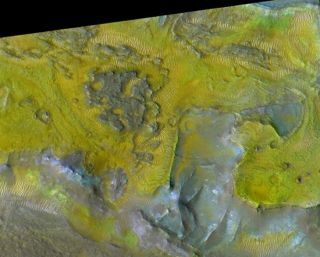 The areaswith carbonates found by MRO's CRISM (Compact Reconnaissance ImagingSpectrometer for Mars) instrument were: Nili Fossae, which is 414 miles( 667kilometers) long and lied at the edge of the Isidis impact basin; some sides oferoded mesas; sedimentary rocks within Jezero crater; and rocks exposed on thesides of valleys in the crater's watershed. Traces were also found in TerraTyrrhena and Libya Montes. "Thisis opening up a range of environments on Mars," said study co-author JackMustard, a professor at Brown. CRISM hasscoured Mars' surface looking for signs of carbonates, but this is the firsttime it has turned any up. This could indicate that this is "a localenvironment on Mars that is somewhat unique," Ehlmann said. Still,there is the possibility that other regions will turn up carbonate signatures,or that carbonate layers could be hidden beneath the surface, she added. Theresearchers have multiple theories for how the carbonates might have formed,including slightly heated groundwater percolating through olivine-rich rocks exposedat the surface and altered by running water or precipitation in small, shallowlakes. The studywas funded by NASA and the National Science Foundation.